The A List: Hello There! As my nearest and dearest know, I'm not an ageist. My love for actors spans generations, and this weekend I had an encounter with one of my "must-meets." It was Saturday evening and my main man and I were taking a drive down Avenue Road. Upon passing one of the ultimate TIFF hotspots, the Park Hyatt Hotel, I noticed a gaggle of girls surround a white Cadillac Escalade. Lucky for me, the car pulled up beside me and continued along my downtown path. 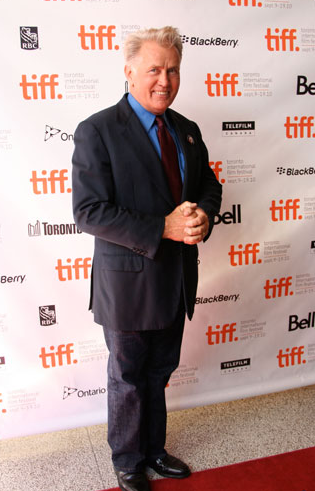 Sneaking a peek into the window, I came face to face to Martin Sheen. Yes, he, of West Wing, Charlie and Emilio fame, was seated in the car next to me. Eager to interact with one of my favorite Hollywood staples, I gave the star a friendly wave and smile. To my surprise, Martin waved back with the smile that made him millions. So continued our journey down Avenue Road, even stopping for Marti to pose for a picture through the window (look closely - you'll see a smile and a waving hand!). Our game of who-waves-best may have ended, but my smile lasted all night long.